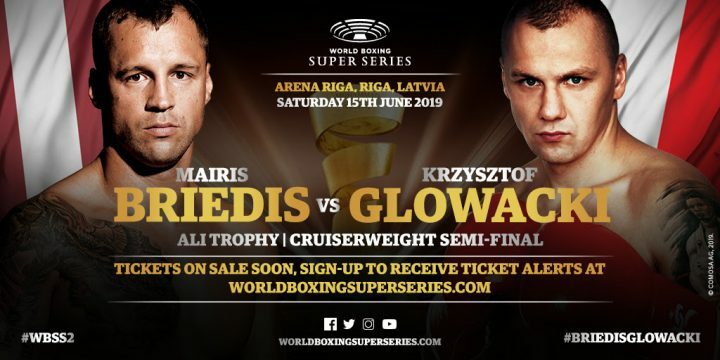 By Allan Fox: Former WBC cruierweight champion Mairis Briedis (25-1, 18 KOs) will be facing former WBO champion Krzysztof Glowacki (31-1, 19 KOs) on June 15 in the semifinal of the World Boxing Super series cruiserweight tournament at the Arena Riga, in Riga, Latvia. What’s disappointing is that the fan are going to have to wait another four months before the Briedis vs. Glowacki semifinal fight takes place on June 15. The fans have already been waiting three months since the two won their quarterfinal matches. The glacial pace of the WBSS cruiserweight tournament makes things too slow to stay excited about the competition. The timing for this fight is a bad one with the 34-year-old Briedis coming off of a highly controversial 12 unanimous decision win over Noel Gevor in the quarterfinal of the WBSS tourney on November 10 at the UIC Pavilion, in Chicago, Illinois. Briedis appeared to lose that fight in the eyes of a lot of boxing fans, but he was given a decision by the scores 114-112, 115-111 and 116-110. For his part, the hard hitting southpaw Glowacki, 32, defeated Maksim Vlasov (42-3, 25 KOs) by a 12 round unanimous decision in his last fight on November 10 on the undercard of the Briedis vs. Gevor fight. It goes without saying that Glowacki looked a lot better in winning his fight against Vlasov than Briedis did in beating Gevor by a questionable 12 round decision in the main event. This is the second WBSS cruiserweight tournament Briedis has been involved with. He was beaten a year ago by WBO champion Oleksander Usyk by a close 12 round majority decision in January 2018. Briedis performed a lot better in losing to Usyk than he did in beating Gevor by a controversial decision. Gevor did a better job against Briedis than Usyk did, but he failed to get the win. Briedis will be fighting at home in Riga, Latvia against Glowacki. That means that if Glowacki wants the victory, he’s going to need to raise his game considerbly if he wants to get the decision. Briedis has never been knocked out before, so it’s not going to be easy for Glowacki to try and win the fight by that route. Briedis vs. Glowacki is one half of the equation in the WBSS tournament. The WBSS other semifinal, former WBA cruiserweight champion Yunier ‘The KO Doctor’ Dorticos (23-1, 21 KOs) will be facing Andrew Tabiti at a still to be determined date. Dorticos looked poor in winning his quarterfinal fight in beating Mateusz Masternak by a 12 round unanimous decision last October. Before Dorticos’ fight with Masternak, one would believe that the Cuban knockout artist would make easy work of Tabiti, but not anymore. Dorticos looked really bad against Maternak, and there’s no doubts whether he’ll be able to get the job done against Tabiti.